Battlestar Galactica rebooter Ron Moore says Star Trek needs to return to television and he'd love to be the one to take it there. J.J. Abrams has done big things with the Star Trek movie franchise but its roots are firmly in television. It's a more intimate medium that requires a focus on characters and story rather than bombastic effects, which is really what Star Trek does best. 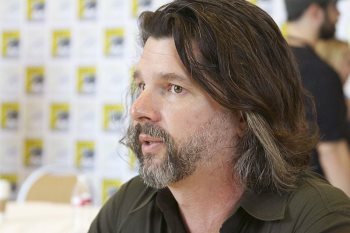 Ron Moore, the guy who masterminded the hit Battlestar Galactica reboot of a few years ago, knows a thing or two about it, too. "I think the features are good and I really admire what J.J. Abrams has done with the last two films - I think it's great - but the heart and soul of that franchise demands a return to television," he told Digital Spy. "The TV shows were morality plays, they were more thematic, they were examining society in different ways. Sometimes the stakes were just one crew member's life, sometimes the stakes were just one alien world or the Enterprise. You could do a story that was just about Data (Brent Spiner) or a story that was just about McCoy (DeForest Kelley) or about the characters who lived below decks on the Enterprise." Moore said he believes that if Star Trek is going to remain a viable franchise, it's going to have to go back to television, a job he'd love to take on and one he has some familiarity with: He's written numerous episodes for past Star Trek series including the final episode for Star Trek: The Next Generation, and also worked on the screenplays for the Star Trek films First Contact and Generations. But he doesn't sound quite ready to jump into it just yet. "I'd love to do Star Trek again, in all honesty. But I also don't have a great new Star Trek idea," he said. "I'm not saying I know exactly how to do a new TV show - I don't. Maybe I shouldn't do it until I have that great epiphany!"